Snow in Wicklow during the 'Beast from the East'. A MOUNTAIN RESCUE team based in Wicklow has revealed that a number of motorists insisted on following their sat-navs onto impassable mountain roads during the recent spells of freezing weather. The Glen of Imaal Mountain Rescue Team said that, of its four most recent call-outs, two were due to people following navigation from their devices and getting stuck in snowdrifts. The team detailed their recent call-outs in a Facebook post, revealing that last Sunday evening they responded to a call from gardaí to help a group of five tourists whose car was stuck in a snowdrift near the Sally Gap. “The five tourists were following their sat-nav when they got stuck, it told them that the shortest way home was over the Sally Gap,” the team said. “The Glen of Imaal Mountain Rescue Team and Dublin-Wicklow Mountain Rescue Team both deployed a vehicle and they drove in convoy, in very poor weather conditions, towards the incident site. In another call-out at 7pm last Tuesday, the two teams were again tasked to a site near the Sally Gap by the gardaí. A car with two people, they were told, had become stuck in a drift. “Mountain rescue personnel were deployed and offered to drop the occupants of the car to Blessington,” the Glen of Imaal team said. They managed to get their own car out but insisted on continuing up the mountains where they got stuck again on the Glencree side and were rescued this time by a local tow truck. The incident was stood down just before 10pm. There were numerous road closures across Wicklow during the snowy weather at the start of the month, and several routes were again closed after more snow fell in the county last weekend. Notices of closures were reported in local and national media, and signs were placed along routes worst affected by the wintry falls. “Please take the time to consider the conditions of the roads along the route that your sat-nav has chosen, they may still be impassable, single lane or flooded,” the team warned. 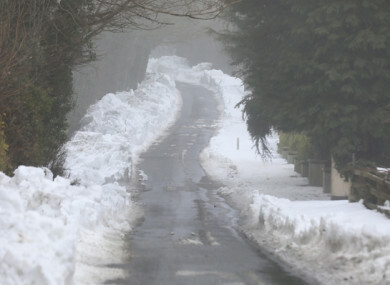 Email “Drivers insisted on following sat-nav straight into Wicklow snowdrifts, rescuers say ”. Feedback on “Drivers insisted on following sat-nav straight into Wicklow snowdrifts, rescuers say ”.